Quinoa, known among the Incas as the” mother of all grains”, quinoa (like some of the other ancient grain such as amaranth and barley) is rapidly growing in popularity because of its wide array of health benefits. Quinoa is natural gluten free. It contains enormous vitamins and mineral with high fiber content. 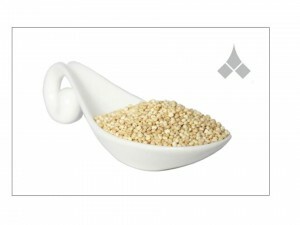 Quinoa is one of plant food which is considered to be complete protein. As it is comprised of all essential amino acids, so it is fruitful food to be vegetarian diet singly. To prepare the quinoa, soak it in cold water for 15 minutes then drain to remove its bitter coating. Boil 2 cups of water and 1cup of Quinoa then reduce the heat and simmer for 15 minute, or until the grains begin to split. Preparing the quinoa by soaking it in cold water for 15 minutes then drain and put in a saucepan, add some water. Cook over medium heat until boil, then reduce the heat and simmer for 15 minute, or until the grains begin to split. To make the porridge, place the quinoa and milk in a saucepan over low – medium heat and stir well. Add some honey and salt, stir and allow it to simmer for another 1-2 minutes. 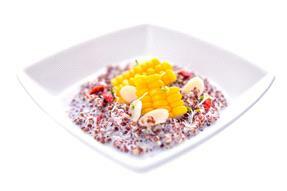 Spoon the quinoa porridge into a serving bowl and garnish with Goji berries, sliced almonds, sweet corn and Ayurvedic digestive aid.